Still busy swiping left or right looking for someone to date? Chuck it. There's something more exciting in town  an app that lets you search for pocket monsters! If you don't believe me, check your social media timeline and you will know what I mean. I decided to give it a try too and the damn thing made me travel all the way to an industrial zone and into a fancy building that had a three-pointed star on top of it. A more accurate search took me into what looked like a parking lot and there it was  hiding under a polyester blanket. I lifted the fabric and underneath was this adorable looking thing. How could someone call it a monster? But apparently it is one. These creatures are known to metamorphose from time to time, and the one I was looking at belongs to the Mercedes-Benz species. In its past form, it was called 'Sportlich Leicht Kurz' or SLK, which in human-speak stands for 'Sporty, Light and Short'. 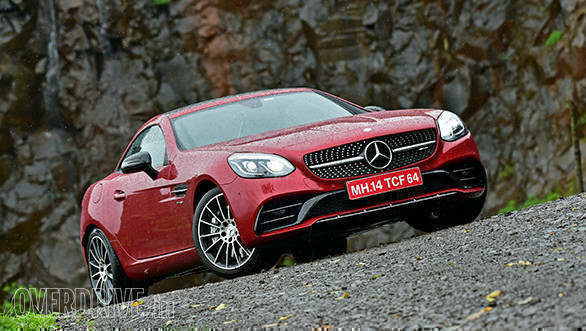 But its transformation has given it a new name now - 'Sportlich Leicht Cee', with the last bit now denoting that this roadster belongs to the C-Classification in the Mercedes-Benz universe. The metamorphosis has given it innocent looking LED eyes - four of them - and apparently they can move independently of one another, letting this creature look in more directions at a time than naturally possible. It has also pierced its nose with 211 studs, because they say piercings are the sign of a fighter. It also wears a battle suit made of fins, splitters and wings that apparently gives it better agility, efficiency and speed. Legend says that anyone who can capture and control these monsters becomes their owner or 'trainer'. This monster in particular has a comfortable saddle for its trainer to ride in. Things haven't evolved much in here though apart from a new steering wheel design, a large entertainment screen, a push-button starter and new gear selector with the 'SLC' subspecies classification engraved on it. The SLC's suit also comes with a retractable helmet which acts as a roof for the passengers and can be stowed away into the backpack within seconds with the flick of a switch. Even without the roof on, the SLC is quite aerodynamic. In fact, driving at respectable speeds in a drizzle hardly had any rain droplets fall in, and in clear weather, there is no wind buffeting even at highway speeds. Apart from evolving from time to time, these monsters are also known to power-up for more attack and speed, and the SLC has done so too. 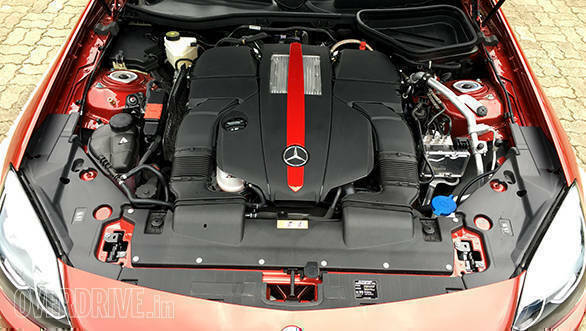 For beginners, the power-ups give it a defining AMG badge which it proudly wears on multiple places on its body. 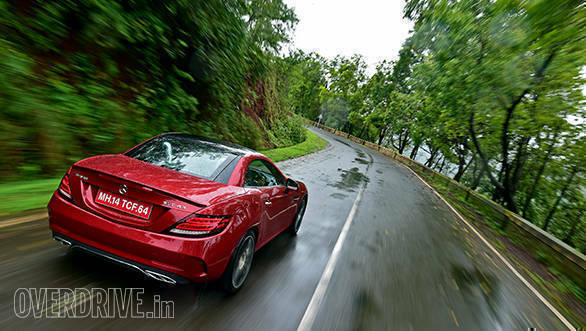 But other trainers are quick to point out that the SLC's stats have actually dropped during its transformation from the SLK and that may have dampened its spirit. 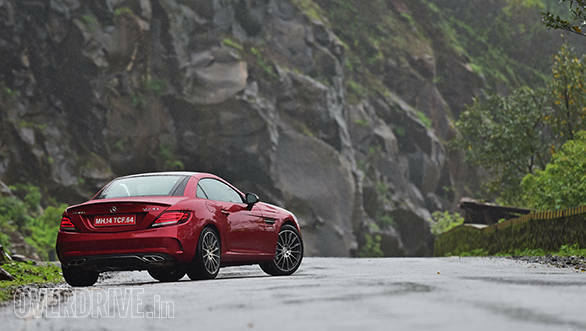 So unlike the V8-hearted SLK 55 AMG, which had natural aspirations for battle, the SLC 43 receives supplements like two turbochargers to muscle up. The purists don't like it - so much so that the elite monks at the temple of AMG in Affalterbach refuse to mark their symbolic insignia on the SLC's heart. But there is more to it than just the stats. 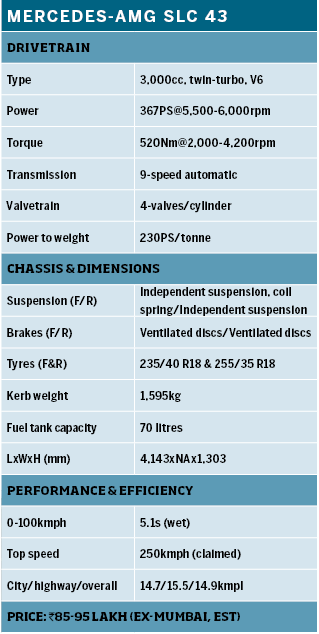 It is about how it performs where it matters. Its fist is smaller and the punch is only marginally slower, but the impact is way more powerful now. 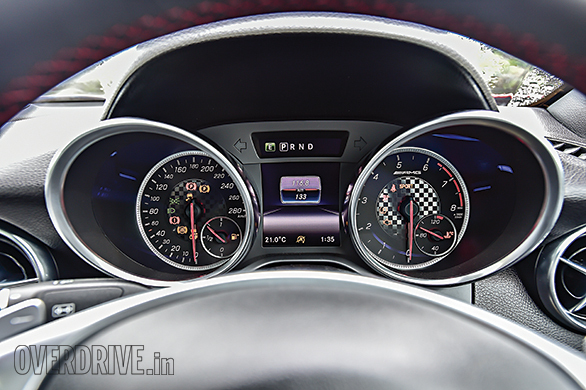 While its predecessor could deliver its peak twist of 540Nm at 4,500rpm, the SLC's smaller 3.0l V6 delivers 520Nm from as low as 2,000rpm. The result is that it can pull you out of corners much faster and also keep enough power on tap for a quick shove or rolling sprint. 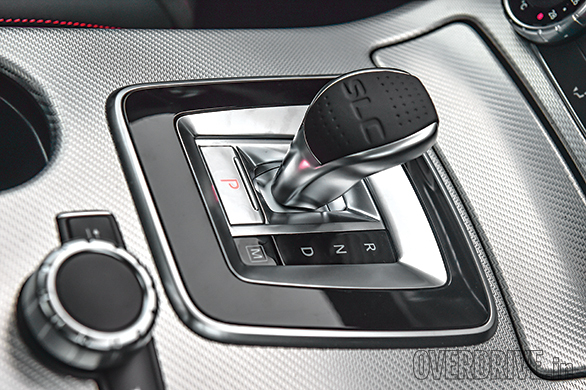 Complementing this ability is the 9-speed gearbox  a weapon found on most evolved subspecies of Mercedes-Benz. But while it works well with the luxury cars, it is slightly slower in response for a sportscar, especially on downshifts. It is best enjoyed in the Sports + mode where it activates a double de-clutching function. Shift to manual mode with the press of the M switch and you'll realise how rev-happy this engine is. You will find yourself racing to the limiter/redline too often, so get used to driving with your fingers on the flappy paddles behind the wheel. The torque surge from the bi-turbo configuration also means that power delivery doesn't feel as linear. So if you don't modulate the throttle well, the electronic leash will be tightened every now and then and that can rob the SLC off its fun character. The way around it is to again summon the Sports + mode and manual shifting and turn off traction control partially or completely. The chassis tightens up, steering responses get sharper, the exhaust gets angrier and you have a better control on the way the drivetrain behaves. This chassis is quite sorted and won't push you into unpredictable slides easily  like the F-type would  but it will also let you swish the tail when you want to. The SLC 43 has a new suspension set-up mated to stiffer steering knuckles and a revised camber for the tyres. It also gets a mechanical limited slip differential. Add to it the squat, roadster form with all four wheels pushed to the extreme corners and you have a pet that obeys you well around twisties. It is quick to turn-in and feels light on its feet but holds the intended line very well. I would have liked it to be a little more communicative with its steering wheel though (its time it learned something from its elder sibling, the GT). Is it a good companion for long-distance expeditions, then? Mechanically, yes. Practically, no. Since there is an engine in the front and a folded roof in its boot, there isn't enough space even for a picnic basket. You can slip in a slim suitcase or backpack maybe, but that is it. It is also strictly a two seater  no planks in the back for kids either. It is better enjoyed then for short weekend stints or a drive to the beach or into the mountains - with the roof down if the conditions allow it. The SLC 43's dynamic abilities aren't a match for its biggest nemesis, the Porsche Boxster, which feels more composed, direct and flatter through corners. I'm talking about the outgoing six-cylinder model, of course, but I believe that the 718 Boxster will only surpass those capabilities. Where the SLC 43 might scare the 718 though is with its growl (and with the retractable hardtop, maybe). The boxer-four in the Porsche may not sound as good as this V6. 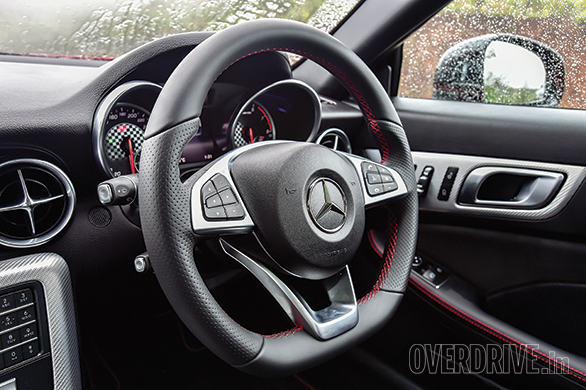 Despite losing two cylinders and getting a couple of turbines, the SLC 43 isn't a wheezer like the CLA 45. Instead, it has plenty of V-engine growl and the customary pops and crackles on overrun to keep you entertained. Agreed, if you have already heard the authoritative roar of the previous V8, then the V6 growl will sound like a purr. But it's a compromise that is hard but worth making if you look at the benefits. 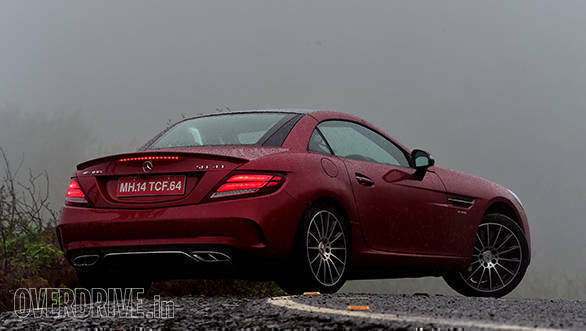 Even in pouring wet conditions, it managed 5.1s to 100kmph, which is only 0.2s slower to what we managed last time around with the SLK 55 AMG in favourable dry conditions. Furthermore, the smaller heart makes the '43 less-thirsty than the '55, and it also emits lesser of those unhealthy CO2. 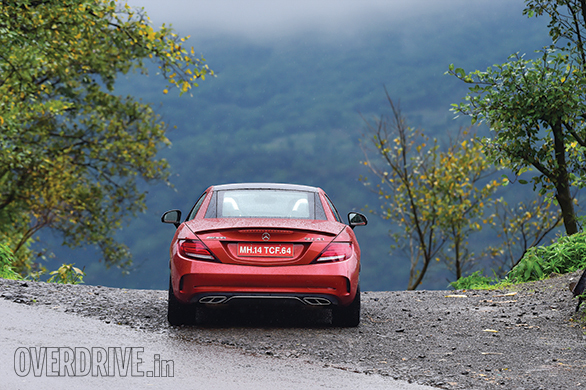 Shifting into the Eco mode and peacefully trotting around the urban landscape only demanded 6.7 litres of fuel per 100km (14.76kmpl), while jogging at consistent highway speeds revealed an efficiency of 15.5kmpl, which is amazing for an AMG! Step on the gas too often and the numbers will quickly drop to single digits. Another big benefit that may come with the new engine is in the sticker price. 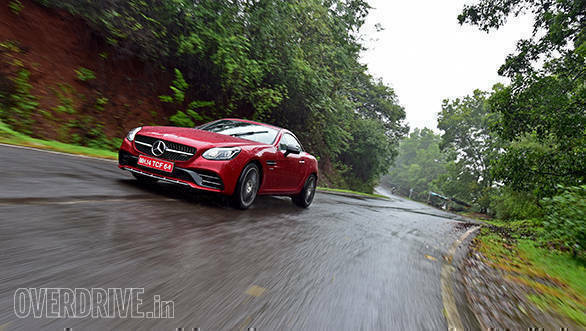 It is the same engine that enabled Mercedes-Benz to keep the price of the GLE Coupé 450 AMG under a crore, while the outgoing ML63 AMG was priced way higher. 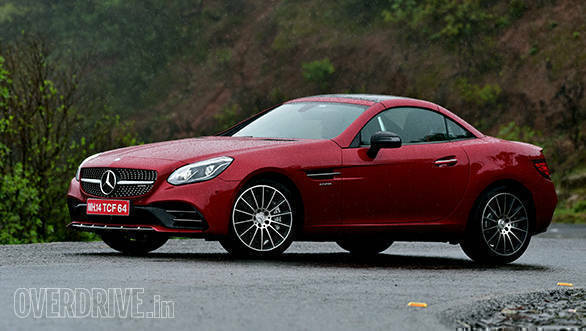 I expect a similar treatment for the SLC 43 over the SLK 55 too. 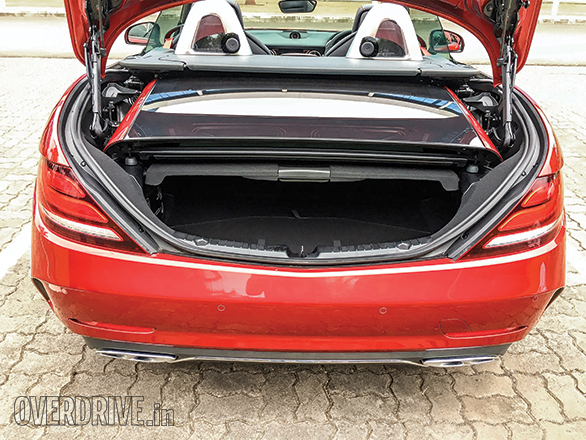 It could also open doors for a more powerful SLC 63 AMG (fingers crossed). Still spending hours on your phone searching for dates or monsters? Chuck it. There's something more exciting to do  open-top motoring! If you don't believe me, get off your phone and drive up a mountain in this lovely weather with your windows rolled down and you'll get a hint of what I mean. And you never know, get yourself a little monster like this SLC 43 and dates could follow!